[OFFICIAL] 75% OFF Digiarty 2019 Holiday Coupon Sales – WinX DVD Ripper License Code, Video Converter Full Version. How to Redeem: Click Buy Now to enter the shopping cart → Find "I have a discount coupon" → Input WINX-19SP-OFFER → Refresh! Lifetime Full License with Free Upgrade; 30-day money back guarantee. How to Redeem: Click Buy Now to enter the shopping cart → Find "I have a discount coupon" → Input WINX-19SP-OFFER → Refresh and save big! √ 30-Day Money Back Guarantee. 5 min - rip DVD to MP4 and any digital. Strongest for 99-title disc and the latest DVDs. All-in-one video converter, editor & downloader. Trim, merge, crop, subtitle, and more. DVD to DVD/ISO image. 9 DVD copy modes. 1:1 revive even old discs. More than iTunes alternative. Transfer & manage iOS files freely. No data erasing. Output: MP4, MP3, H.264, AVI, MKV, WMV, FLV, HEVC/H.265, iPhone, iPad, Android, etc. Video Edit: Crop/ trim video clips; Merge several titles; Add subtitle, etc. ● Ultimate video converter, downloader and slideshow maker. ● Convert any SD/HD video to any format and mobile phones. ● Download video from 1000+ sites, like YouTube, Facebook, etc. ● GPU accelerated. Fast convert between MKV, HEVC, MP4, AVI, etc. ● Edit parameters, merge, crop, trim and add SRT subtitle. ● Strongest for 99-title DVDs. Make your old/new disc region free. ● DVD to MP4, AVI, MOV; to NAS drive, iOS, Android devices, etc. ● Keep intact quality with smallest possible file size. Customize & edit. ● Support Intel QSV, Nvidia NVENC/CUDA. Digitizing DVD in 5 min. ● Ditch iTunes, transfer iOS media files securely with fastest speed. ● Auto-convert and compress files to fit iPhone, iPad without iTunes. ● Remove iTunes DRM, play iTunes purchases on non-Apple devices. ● Create ringtone; Modify music playlists; Turn iDevice to USB, etc. With WinX DVD Ripper Platinum Edition you can digitize DVD with highly enhanced hardware accelerated DVD video processing. If you want a fast, effective, and fairly user-friendly DVD-ripping solution, WinX DVD Ripper Platinum is the best to go. 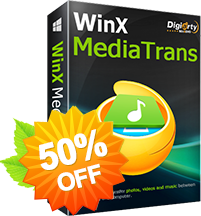 WinX MediaTrans is just the kind of simple, streamlined, easy-to-use tool we’ve all been looking for, enabling you to transfer files in seconds without the pain. What’s more, it help you maximize your iPhone’s storage space, so that you can enjoy all your media without any bother.